This is a big boozer that I can imagine always being busy. 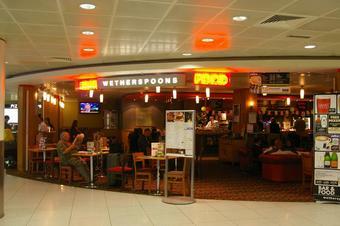 I�m not a Wetherspoons fan, but this is one of the better ones, which I found surprising for an airport. This is a great pub for travellers and staff. The bar staff - a real mixed bunch - are really good and looked after by the working supervisors. The staff are attentive and on the whole a really good asset and advert for british hospitality.